With a vibrant pair of printed drawstring pyjamas, this nightwear set will lend your boy stylish comfort. It comes with a dark t-shirt with a crew neck and short sleeves. 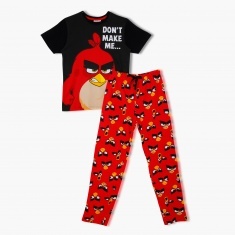 The breathable fabric sporting a cool Angry Bird print adds to its appeal.